I still hadn't heard anything back from HoN Co. about the task force, or any more information about the book. Sitting in my house and flicking through it was driving me nuts! I was scared, but I needed to do something... even if it was something trivial like checking on my farm... So that's what I did; early in the morning, I went down and checked on my farm. It was doing great, and I decided to harvest the wheat now. I might not get a better chance at any point in the future, and I didn't want it to spoil. I took the wheat harvest back to the house and then returned to the beach... That's when I decided that if the task force would arrive in a few days, they'd need a way to land the boat. I don't know how many are coming, but if they come by boat and they are planning on pulling off a big investigation, it's going to be a big one! I drew up plans for a peer or runway for the boat to pull up alongside allowing them to disembark quickly. To do this though I had to either raise the level of the beach head, or extend the peer out into deeper water. I decided that the latter would be better for both arriving and launching! Within a few hours, I had the peer finished and ready to receive the task force... Throughout the entire build, I had kept a watchful eye on my back; I didn't want anything getting the jump on me, and occasionally I ended up shooting a cow or pig with an arrow if it got too close! I then spent the better part of an hour removing the cacti plantation; it was of no use to anyone! If anything, it'd be more of a hinderance then a help! So I burnt it... 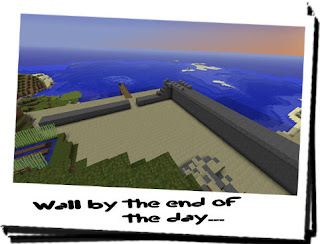 It was then that I got a genius idea to protect my buildings and the other resources that I accessed: build a wall! It seemed simple, but by building a wall I could keep unwanted things out, and protect my assets! If I had towers at each of the four corners, I'd also be able to keep a lookout for anything trying to get in, as well as the task force before they arrived. I spent a good hour drawing up plans for that too; I wanted to make sure it was perfect, that it covered everywhere I went and that it didn't have any blindspots! I was so excited about this I started straight away! I had masses of stone kept to one side which I effectively put to use for the walls. 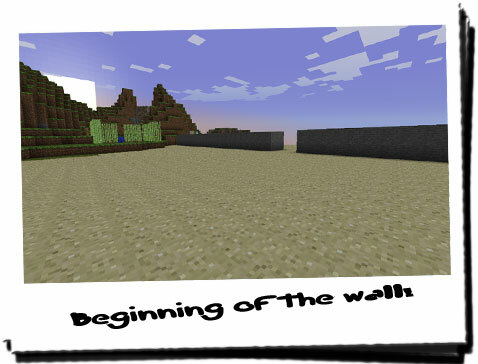 But I decided to make the wall thicker than intially intended; this was to truly stop anything coming through them, and hopefully defend against an explosion... like that of a Creeper. 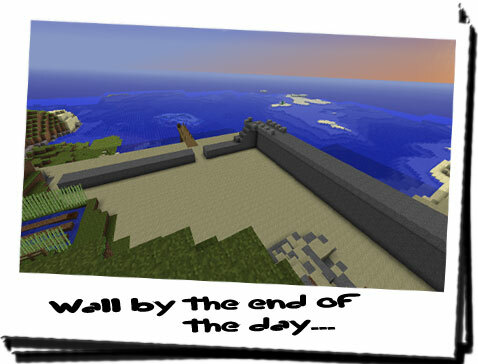 Within a few hours, I had the basic structure for the wall ready, and the majority of it was protecting the beach head! All I needed to do now was to extend it across the length of the beach to cover the entirety of my assets. This included things like my forest and forge. Although my main worry was the cliff system; my forge was incredibly close to the cliff, and the last thing I wanted was to disrupt any more creatures! I continued with the wall building pretty much until sun down; all the while I kept an eye out for anything unusual... or Creeperish. But nothing... since the incident a few days ago, I hadn't seen anything else suspicious at all. The only other notable suspicion was the increase in weather variations; it had rained considerably more since the incident with the Creeper, and I was beginning to think that they might be linked! I've decided to leave it for tonight and have another crack at it tomorrow, and see how far I get! I'm hoping by tomorrow I'll have one full wall done, and maybe a tower for observation!